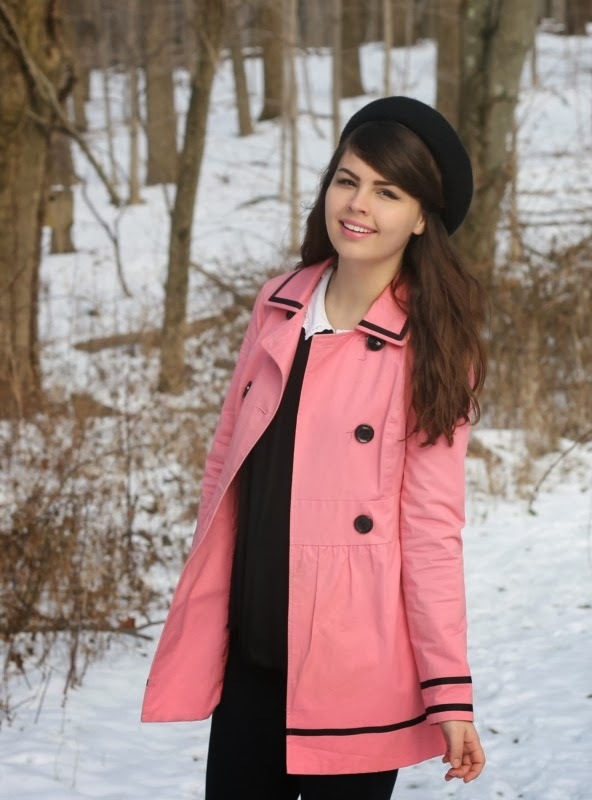 Pink Trench Coat: Kohl's (so old!). 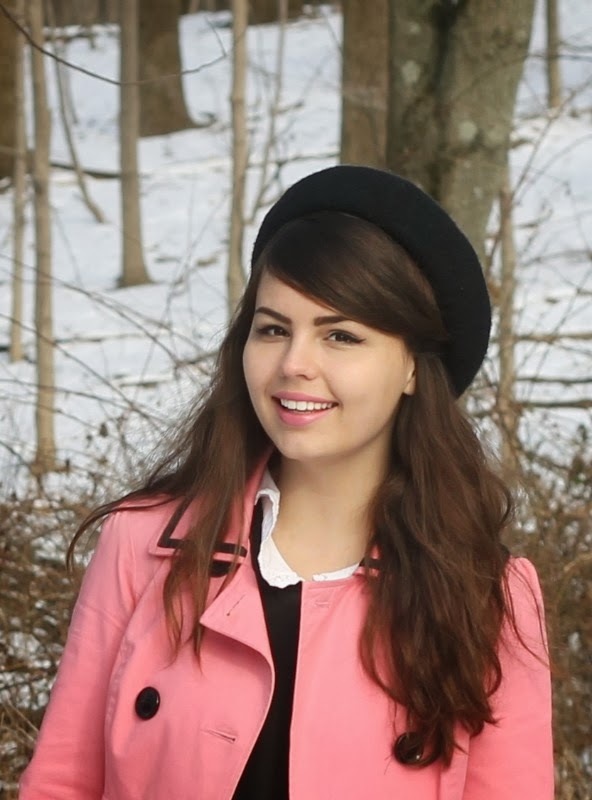 Black Jeans, Peter Pan Collar Top: Forever21. Lipstick in MAC's Speed Dial. Bringing out some really old pieces in my closet! It's a miracle this coat has survived my changing style all of these years. I got this for Christmas in 8th grade and have never thought about selling it or giving it away. Surprising, since I hardly have kept any of the clothes from that point in my life (from about 8th grade to high school sophomore year). That period of time was mostly spent buying clothing that I knew would impress people and make me seem fashionable. None of them were actually pieces I liked personally. Makes me so sad that I even did that, but I'm thankful I went through that stage because going through it helped me realize my own personal style. 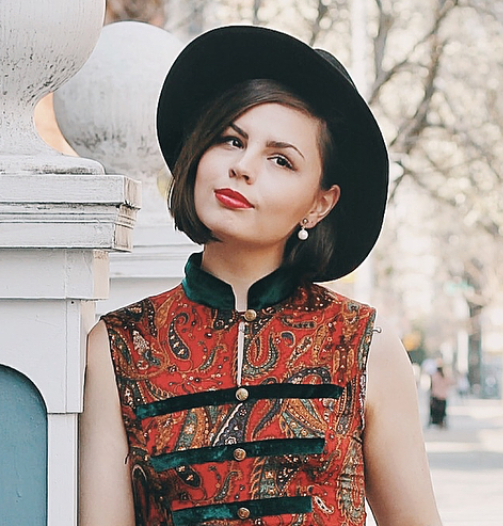 What especially helped me start to find my personal style was discovering thrifting and vintage. At that point I realized that I actually didn't like trendy clothing, but felt more comfortable in retro style. So it's funny that six years later although my style has gone through so much of an evolution, I still love this coat just as much. Here's a little laugh at when I first wore it. So different than now. It's always funny looking back! It's a great time. That coat is fashionable to infinity and beyond so I am not at all surprised you were chic-savvy enough to hold onto it. So like that little collar on the top and those shoes are impressive and cool. Your little flashback link was SO cute. very glad you allowed your own style to develop and leave the expectations and approval of others behind. Due to this, the world in gifted with a stunning, smart, elegant style worn by a sweet, radiant, amazing woman. This coat really is awesome. It seems like a piece to hold on to. I randomly ended up wearing a simple black wool coat I had stored away at home just the other day. I think it was from my freshman year of high school...so quite a while back! Some things should be held on to, I think! 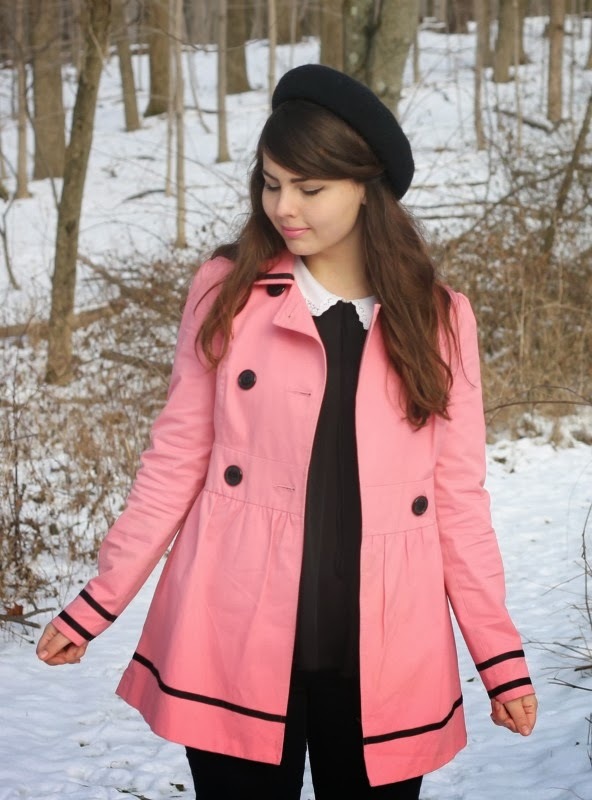 Especially things as cute as your pink coat. I love it with the beret and black top and jeans. 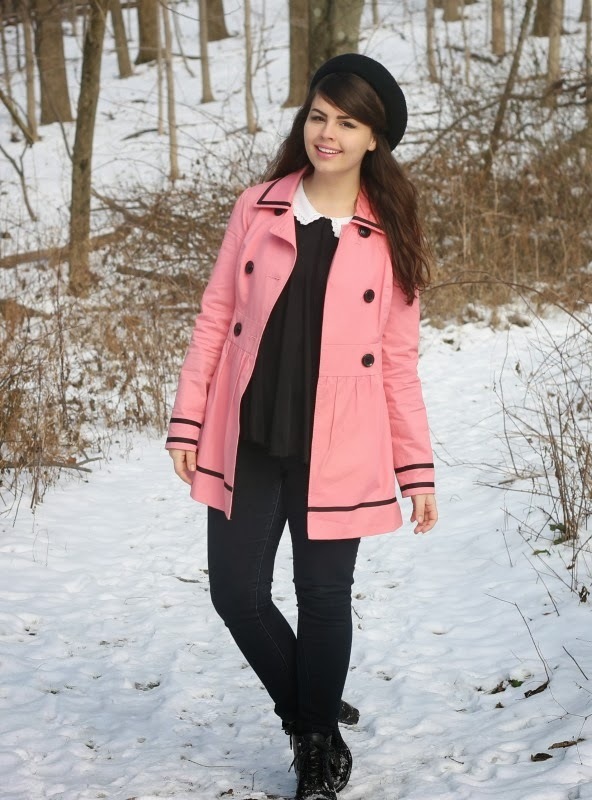 Love your pink coat! It's adorable! 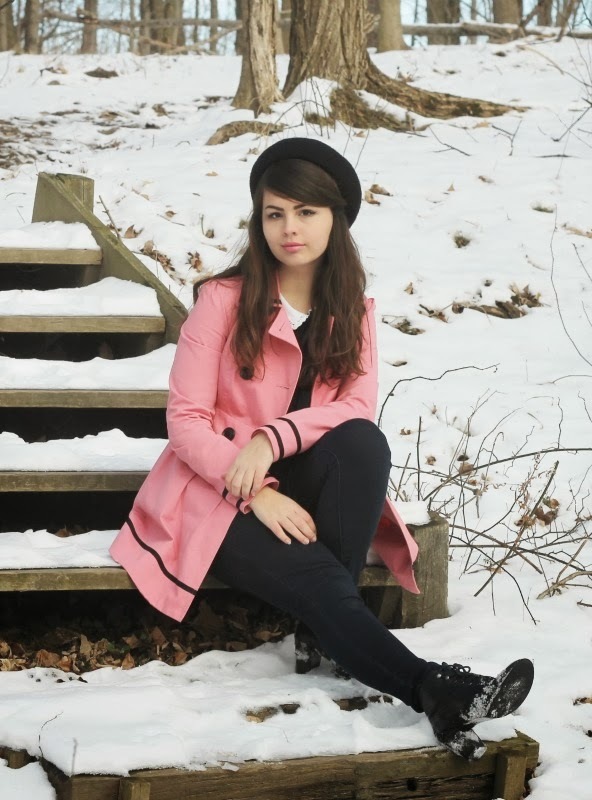 Everyone is talking about pink coats right now so I never would have guessed you've had this for so long. You remind me of Jackie Kennedy in these pictures :) And how cool that you're learning how to hem. I would save so much money if I knew how to haha. That coat is fabulous! I love how you kept your outfit black. freaking out right now cuase that coat is so perfect! I love your pink coat! I think it is a great piece to hold on to and I would love to own a coat as pretty as this one is. I agree that it is nice to have things that you still wear years later, and still love. It shows which bits were really 'you' back then. I like to have some consistency in my wardrobe! The old photos of you do have a different style, but that hat still rocks I think. Hats are always fun - as I think is obvious from your photos. I love the beret collection. I also really wanted to thank you for your thoughtful comment on my blog post recently. I appreciated it. I'm firstly happy to know that you still read my blog. I'm glad you enjoy what I do. I felt really touched by what you had to say about it to. I guess it's the quality of the readers not the quantity that matters. :) So thanks. You did another outfit with jeans! ;) I really love this, you look adorable, and it co-ordinates really well.